Vatican Bows to Pressure, Releases Retired Pope's Letter - Integration Through Media ....! 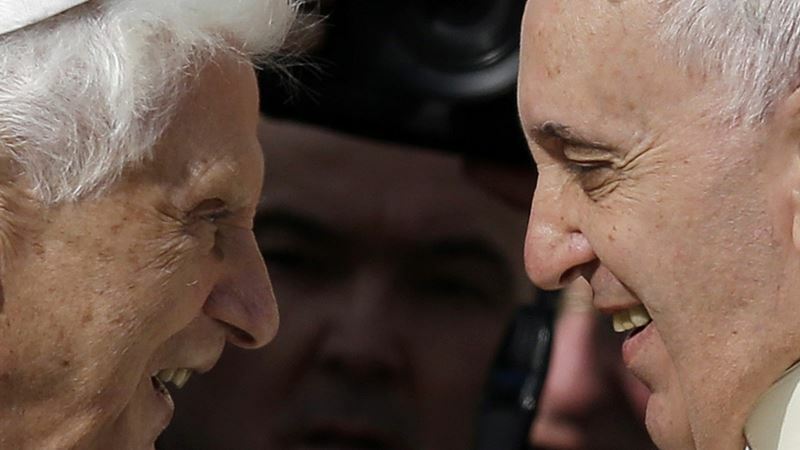 (VOA): Stung by accusations of spreading “fake news,” the Vatican on Saturday released the complete letter by Emeritus Pope Benedict XVI about Pope Francis after coming under blistering criticism for selectively citing it in a press release and digitally manipulating a photograph of it. The previously hidden part of the letter provides the full explanation of why Benedict refused to write a commentary on a new Vatican-published compilation of books about Francis' theological and philosophical background that was released to mark his fifth anniversary as pope. In addition to saying he didn't have time, Benedict noted that one of the authors involved in the project had launched “virulent,” “anti-papist” attacks against his teaching and that of St. John Paul II. He said he was “surprised” the Vatican had chosen the theologian to be included in the 11-volume The Theology of Pope Francis. “I'm certain you can understand why I'm declining,” Benedict wrote. The Vatican's Secretariat for Communications said Saturday that it was releasing the full text of the letter because of the controversy over the “presumed manipulation” of information when the volume was launched Monday with great fanfare on the eve of Francis' anniversary. The so-called “Lettergate” scandal has embarrassed the Vatican's communications operations and fueled the growing chasm between supporters of Francis' pastoral-focused papacy and conservatives who long for the doctrine-minded tenure of Benedict. A Twitter hashtag of #releasetheletter went viral among Catholic conservatives as the scandal widened. The Secretariat for Communication, in particular, was accused of spreading “fake news” for having omitted key parts of Benedict's letter and — as The Associated Press reported — digitally blurring a photograph of the document where Benedict started to explain why he wouldn't comment on the book. Many commentators noted the irony of accusations that the Vatican's communications office was spreading “fake news,” since Francis dedicated his annual message for the church's social communications day to fighting “fake news” and the distortion of information. Francis has frequently criticized journalists for only giving half of the story. The scandal began when the prefect of the communications office, Monsignor Dario Vigano, read part of Benedict's letter aloud at the book presentation Monday. Vigano explained that he had sent Benedict the 11-volume set months ago in hopes of eliciting a theological commentary from the retired pope. In the parts of Benedict's letter that Vigano chose to read, Benedict confirmed that Francis has a solid theological and philosophical training and he praised the book initiative for showing the “interior continuity” between the two papacies. He wrote it was “foolish prejudice” to paint Francis as only a practical man devoid of theology and Benedict as a mere academic who knew nothing of the lives of ordinary faithful. Vigano held up the letter as evidence of the theological continuity between the two papacies, an effort to blunt conservative critics of Francis' mercy-over-morals priorities and emphasis on “discernment” over hard and fast doctrine. But Benedict's full caveat about his refusal to comment on the volume was never made public in Vigano's presentation, press release or accompanying photo. That omission left the impression that the 91-year-old retired pope had read the volume and fully endorsed it, when in fact he hadn't. As a result, Vigano's effort to show papal continuity effectively backfired. Benedict's harsh criticism of German theologian Peter Huenermann, who penned one of the 11 books, laid bare the differences in theological approaches of the two popes. The first hint there was more to the initial story came when a longtime Vatican reporter, Sandro Magister, published a transcript of what Vigano had read aloud at the presentation, which was more than what was included in the Vatican's press release. Magister's transcript of the letter contained Benedict's initial explanation that he couldn't read the 11 volumes because of his age and other commitments, and therefore couldn't comment on it. Magister on Saturday reported that the omitted paragraph concerned Benedict's objection to Huenermann, who has joined leading European progressive theologians since the 1980s in penning open letters attacking the policies of John Paul and Benedict. Left unsaid is who was responsible for selecting Huenermann to write one of the 11 books in Francis' anniversary anthology, given the author's past attacks on the retired pope, who lives just across the Vatican gardens from Francis.